MainAll NewsInside IsraelPoll: Gantz or Lapid to lead left? 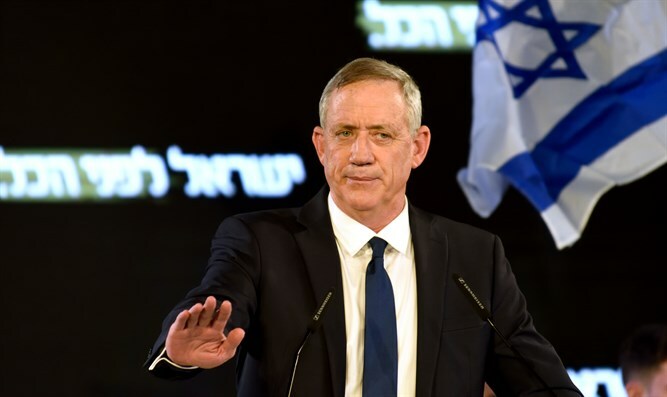 Poll: Gantz or Lapid to lead left? TV poll asks the public who they prefer to see at the head of the leftist bloc. A poll published Saturday night on Channel 12 News gives a clear advantage to Benny Gantz in the fight for the leadership of the center-left bloc - should such a bloc be established. 36% of respondents supported Benny Gantz as head of the bloc, and only 11% said Yair Lapid should lead the bloc. Avi Gabbay and Tzipi Livni received only 5% of support in this question. Almost half of the general public answered "no one" or said they had no opinion on the subject. The participants were also asked where they would place Gantz's Israel Resilience party on the political-security ladder - right or left? 34% said the party is more left-wing, 26% said it was more right-wing, and 24% placed it in the center of the political arena. The poll also examined whether the public is satisfied or dissatisfied with the performance of Moshe Kahlon as finance minister. 41% responded that they were satisfied, 45% replied that they were not satisfied with the minister's performance, and the rest did not know how to respond. The poll follows a Maariv poll published on Friday and which found that a merger between Gantz and Lapid's Yesh Atid would tie the Likud as Israel's largest party. Without such a merger occurring, the survey found that the Likud would get 31 seats while Gantz would get 20, far ahead of the 12 Yesh Atid would receive. Yesh Atid MK Yael German suggested in an interview last week that Lapid would theoretically be prepared to vacate his spot at the helm of any union with Gantz. "I'm not ruling out anything. I'm leaving it in the hands of Yair Lapid as the one who handles our negotiations and I trust him," she said.